This document brings together some of the important commands, scripts and other information for working with Xfce. Many are extracted from various Xfce Forum posts, usually by ToZ. NOTE: for now, the document lacks any overriding structure, serving merely as a repository of material. This command can be used to install a new icon set (does not work on svg icons). The three (simple, balou, mice) are hard coded, but “Simple” is configurable with respect to font, background/text colors and background image. Click on the “Configure” button to change those properties. Channel names are those in ~/.config/xfce4/xfconf/xfce-perchannel-xml/, see the Xfce4 Start page. More on the command xfconf-query here and here. Adjust the “5” as required. …and authenticate when prompted. This will create a gvfs-mounted share in thunar. Simply right-click the file in question and select “Open With Mousepad/Leafpad”. If you have write permissions on the server for this file, you should be able to edit and save the file. Note: you need to have gvfs (or gvfs-fuse) installed. …to a keyboard combination. When you resume from suspend, press the keyboard combination. Make a file in your home folder called .gtkrc-2.0 (or edit if you have one) and add the following info. log out and log in and you should have long file names. You can change the font of the title if you use the pango markup language. Right-click on the Menu > Properties. Set the top pull-down Display menu to ‘Title’ or ‘Icon and title’. That way text will be displayed on a Whisker Menu button. Details in the Xfce Wiki. This will affect all launchers, but you can be more specific with the widget name to affect individual launchers. The title parameter will change the first part of the filename (defaults to “Screenshot”) and the second will turn on or off the appending of the timestamp after the filename. If you turn off the timestamp, the program is smart enough to append a -1, -2, -3, etc to the end of the filename, if a file exists with that name already. Be sure that the paths and names are correct. Save it somewhere in your Home directory, and give it a name. Let’s suppose you name it “LaunchAll.sh” and place it in ~/Home/Scripts. Right-click it > Properties, Permissions tab, and check the box to make it run as a program. 2. Right-click the panel > Panel > Add New Items… > Launcher, click Add; then right-click the new icon > Properties and click the Add a new empty item icon. Alternatively, on the desktop > Create Launcher. Either way, you will end up looking at the launcher’s dialog box. 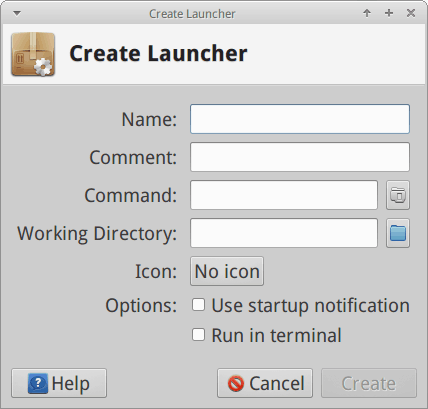 Give the launcher a name such as LaunchAll, and then click on the little square to the right of the Command line to navigate to your script. Select an icon if you want one. That’s it: now when you click that icon, all the programs you listed in your script will launch. BTW: if you want those applications not to show up on the same disorganized workspace, this would be a great time to make use of gdevilspie. You could use a udev rule and script such as this one that will be called and executed when udev reports the connection/disconnection of the monitor. Alternatively, one can write a script that calls xrandr to set up the screen arrangement and then bind this to a keyboard shortcut. You can easily assign a key combination to any Custom action. For example, if you have the “Open in Terminal” custom action (or something similar), you can assign a keyboard shortcut key to it. To do so, first enable editable accelerators in Settings Manager > Appearance > Settings. Then, in Thunar, hover your mouse over the File>Open in Terminal menu item and press the keyboard combination that you would like to use for that action. Then when browsing in Thunar, use the keyboard combination to open a terminal window in your active directory. in the (new) folder “.gtk-3.0* to force non-symboic icons for the panel plugins that have ported to GTK3. It will work with single files (%f) and multiple files (%F). Comment out one of the append or prepend actions if you don’t want both to happen. The text inside the columns of Thunar is often jammed up against the right column edge. ToZ looked at the code and found that this snippet will fix it. Create a new file ~/.gtkrc-2.0 and paste in the code below. Then log out and back in to see the effect. You can vary the value (10, 15, ,etc.) to suit your tastes. Save it somewhere (/usr/local/bin if you want all users to access it), make it executable and assign it to a keyboard shortcut. You can return to the MX Linux config by restoring the backup. [Arch Wiki via ToZ). Go to each internal drive, and from the right pane or address bar drag it into the PLACES list. Drag them into your desired order. Now right-click the empty space to the right of the word “DEVICES” in the left pane and uncheck them. They will disappear, giving their vertical space back, and you will be left with a tidy list of devices in the order you want. Since Xfce is modular, its various components have their own versioning scheme. Usually the version reported is for xfdesktop. There are a couple of ways to do this. Click Start menu > MX Tools > Quick System Info (command line: inxi -S). You will see in the first stanza an entry called “Desktop” followed by a version number. Install libxfce4ui-utils. Then you will find an entry in the menu called “About Xfce” or get the same information from entering xfce4-about in a console. See this lengthy Forum post. A quick way to make such a global change is to use xfconf-query commands. …and when prompted with the cross cursor select the window that you want hidden from taskbar. …where APPNAME is the name of the app (which you can get from running devilspie in debug mode: “gdevilspie -d”). The plugin genmon captures the output (stdout) of a script or program and displays the resulting string into the panel. It is very powerful as well as handy, though the setup is not obvious. As an example, lets have a click open a thunar window. If you want a clickable image instead, use the following:echo "<img>/path/to/image/file</img><click>thunar</click>"…where “/path/to/image/file” is an actual image file on your computer. Clicking on the plugin will now run thunar.